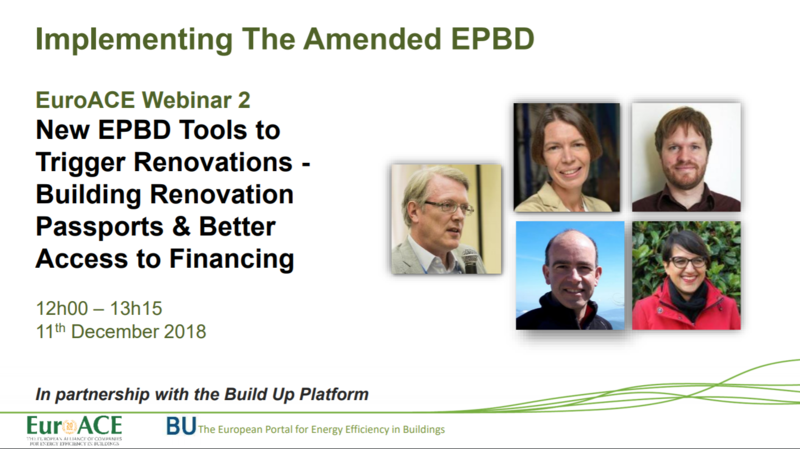 The second webinar of the series took place on December 11th and addressed the new EPBD tools to trigger renovations: building renovation passports and better access to financing. The webinar was moderated by Adrian JOYCE, EuroACE Secretary General, who also introduced a overview of EuroACE Guide to EPBD Implementation. The presentation of EuroACE Guide to EPBD Implementation, focusing on the chapters on ‘Building Renovation Passports’ and ‘Better Access to Financing’, was given by Céline CARRE, EuroACE President. Afterwards the webinar counted with the presentations of Christophe MILIN and Philippe MOSELEY, Project Advisors on H2020 energy efficiency programmes, EASME, about the perspective from the EU level. Subsequently, the perspective from the national level – insights into the IBroad project – was presented by Mariangiola FABBRI, Senior Project Manager, BPIE – Buildings Performance Institute Europe. You can listen to the webinar through this link and take a look at the presentation here!